An exclusive and unique wedding venue, The Morrison has recently reopened following an extensive refurbishment. Renowned for its hip & chic vibe, the recent refurbishment of this boutique hotels in Dublin city centre has echoed these sentiments throughout the renovation. Due to its unique style and funky design it is the perfect venue for couples looking for something that little bit different. Your welcome wedding reception is hosted in the private Art Gallery with direct access from Ormond Quay through stunning Oak doors. The perfect spot for a champagne and canapés reception. This space spills in to a private Courtyard Garden which in turn leads in to the main event room Printworks. Printworks can seat up to 200 wedding guests or can be made into a smaller space to suit a more intimate wedding. Printworks offers an oak floor and white walls. This blank canvas can be dressed, themed or lit to your own personal preference. The Morrison is also approved for civil ceremonies & is located just across the river from City Hall. 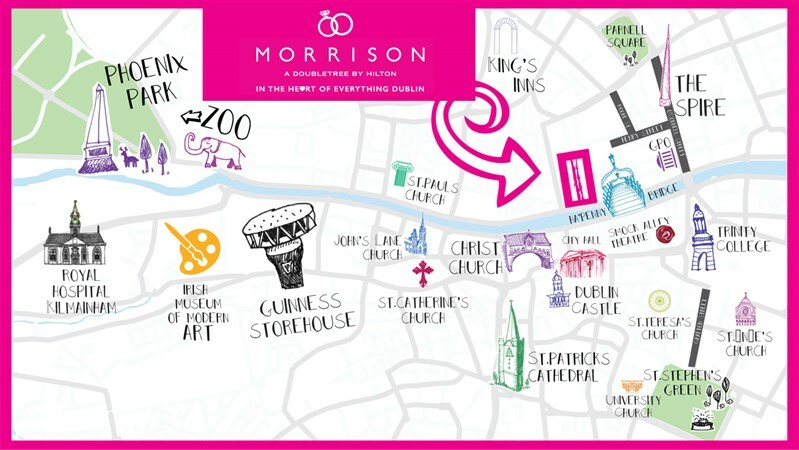 The Morrison is ideally located “In The Heart Of Everything Dublin”. We are perfectly placed close to a variety of superb venues which you can choose from to hold your civil ceremony such as Smock Alley, Trinity college and the iconic City Hall. Not to mention the abundance of picturesque local urban settings including the famous Ha’penny Bridge, Phoenix Park and Christ Church Cathedral where you can create and capture beautiful and unforgettable memories. The Morrison the perfect venue to celebrate your day in Urban Luxury….but don’t just take our word for it check out our “In The Heart Of Everything Dublin” map for more ideas.